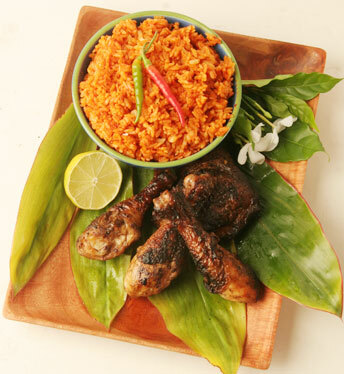 Red rice and barbecued chicken are what you'd find on a Liberation Day menu on Guam -- but there'd be a lot more of it. Should you be flying yourself to Guam over the next few days, you'll be landing in the midst of a major celebration. » Tickets: $20; $10 children. Presale only, includes buffet and dancing to the music of Champagne. » Also: The Hafa Adai Club of Hawaii meets at 1 p.m. on the second Sunday of the month. Dues are $15 per year. Call Tina Aflague DeCoite at the number above. Monday is Liberation Day, celebrated on July 21 -- and for a few days before and after -- in commemoration of the day in 1944 that U.S. troops landed on the island and began clearing out the occupying Japanese. Like the Fourth of July, it's a time of pride, remembrance and lots of good eating. On the U.S. territory, there'll be a carnival, parade and the crowning of a queen. Families will line the parade route on Marine Drive, the main drag through the capital of Hagatna, carrying potluck dishes and/or the fixings of a barbecue. Some will camp out overnight to hold a space. "They have canopies, they have signs, big banners, like 'The Aguon Family,'" says Serafina Sanchez, a Guam expatriate who lives in Honolulu. "The day of the parade, they'll barbecue. They'll have ribs, rice, anything and everything." No one runs out of food, that's a given on Guam, Sanchez says. "In spite of all this crisis we're having, the recession, I don't think so." The traditional foods of the local -- or Chamorro -- culture are rich with coconut, bright with lemon juice and spiced with tiny local chili peppers. Barbecued ribs and chicken are standard, as is kelaguen (like a chicken salad, but sometimes made with seafood or beef) and the starch of choice, red rice. Want a taste? The Hafa Adai Club of Hawaii hosts its annual Liberation Day party on July 26. Club president Tina Aflague DeCoite expects about 300 for the event. The buffet will be a non-Chamorro spread with roast beef and kalua pig, but the club will supplement it with homemade dishes. DeCoite said members gathered a couple of weeks ago to barbecue, chop, vacuum-pack and freeze 60 pounds of chicken, to be used next week to make kelaguen. Four members, herself included, will cook 30 pounds of rice apiece to make red rice. DeCoite, who was born on Guam but has lived in Hawaii since she was 10, is living testament to the pull of the Chamorro culture. Although she's spent most of her life in Hawaii and her father is from Maui, she's long been an active member of the Guam club, supporting its primary mission of assisting Guam residents who are here for medical treatment, military service or school. She describes her children, ages 10 and 17, as "stateside people," but she serves them the Chamorro dishes her mother taught her to make. "It's party-time kinda food; it's not everyday." With fellow club members born and raised on Guam, she said, "it's pretty much Chamorro food all the time."